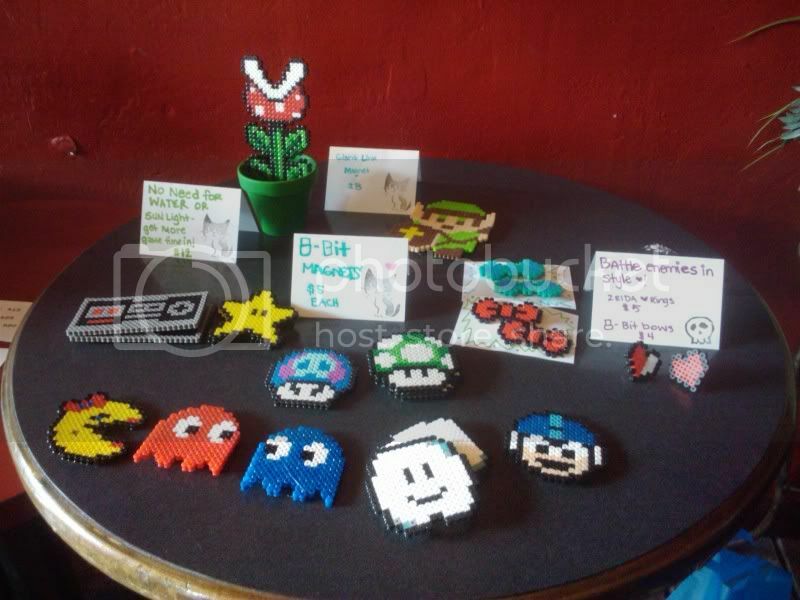 Last Saturday my boyfriend organized the first ever 8 bit art show and concert in our town (and the surrounding towns for the record). It was a super rad show full of old friends and new friends and I am so very proud him of him for doing this! 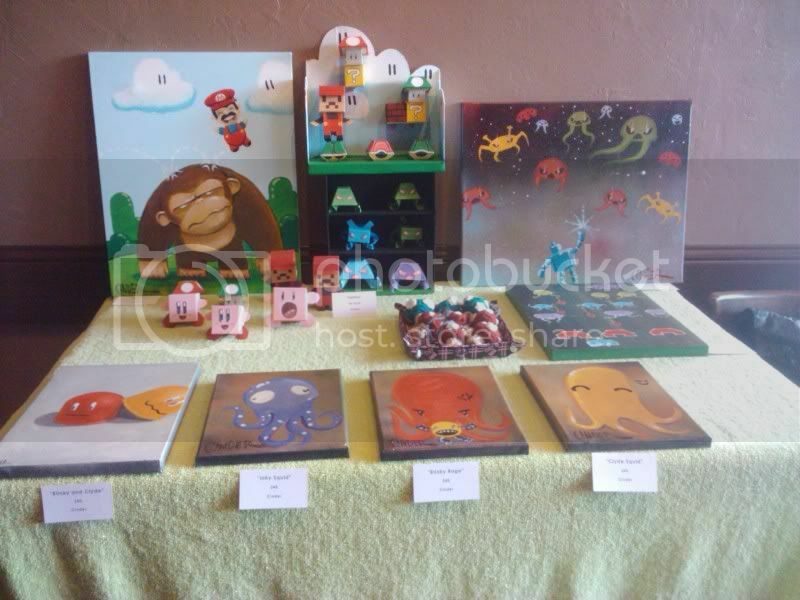 Here are the visual artist's work that was displayed and sold all night long. LoserKid5150's Lego sculptures. If you do not know by now this is my boyfriend's work. 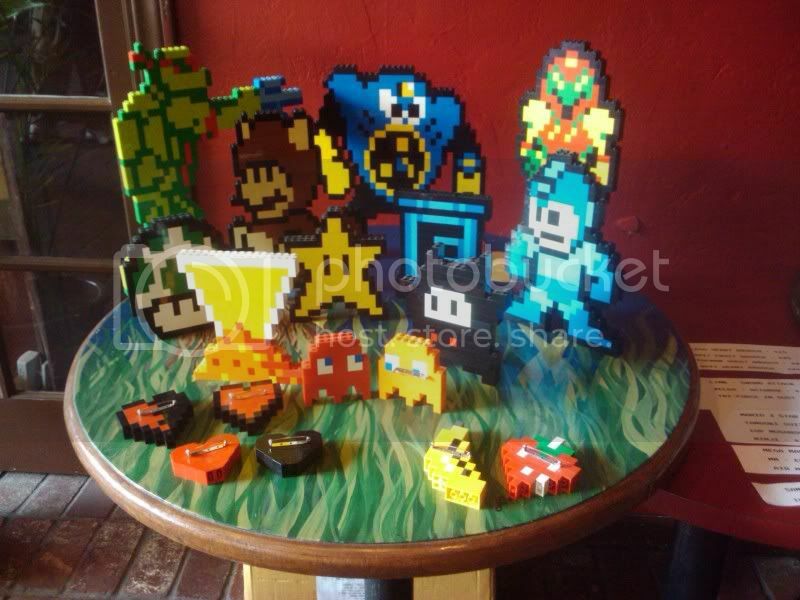 He started this crazy 8-bit Lego madness - now people on Etsy try to replicate his work...Suckers! Some of his bigger pieces made it to a new home that night! Awesome - man up! Cinder Arts drove down from Sacramento to show off his work with his family in tow! Not only is he crafty but he recycles - using paper products to create his paper crafts! He really knows his stuff - he schooled me on paint and techniques! This is my stuff. I play with perler beads on occasion (more so now that I have gotten positive feed back) and my boyfriend asked me to come up with some stuff. I sold a lot that night and had custom orders come in that I am working on. Perler beads really relax me! Stay tuned for the next level...I mean part 2 - the music of the night! Both you and your boyfriend do some really cool work!